WHEN IOWA FARMER Chris Soules first agreed to participate in the reality TV dating show The Bachelorette he assumed that once it was over he would return to rural life and no one would even care who he was. Nearly two years later, Soules has taken a second public chance at love on The Bachelor, learned a few fancy moves on Dancing with the Stars, and amassed a public following that includes nearly 228,000 followers on Twitter. In fact, Soules calls it a responsibility to use his celebrity to be an advocate for agriculture. For Meghan Burke, communications manager at Grain Farmers of Ontario, Soules’ willingness to be a public face of farming presented a unique opportunity for a media blitz that would connect consumers with grain farmers and help promote the Good in Every Grain campaign. The media tour was held over two days in October and involved appearances on Toronto television and radio stations, magazine and newspaper reports, and social media promotion. Grain Farmers of Ontario capitalized on that interest by connecting Soules with Daryl Haanstra, a Smithville grain farmer, and his family. The day spent at the Haanstra farm was captured through photos and videos that were shown during live television appearances and two videos produced specifically for the Good in Every Grain website. Media outlets e-talk and Hello! magazine were also given access to Soules on the Haanstra farm. Haanstra and his wife, Leah, an occupational therapist, have three children: Connor, 7; Olivia, 5; and Alyson 2. They are expecting their fourth child in December. The farm business, known as Twenty View Farms, employs five full-time workers and includes growing cash crops on 1,000 acres, providing custom farm services, and operating a newly licensed grain elevator, that was completed in October, as a way to diversify the business and fill a need in the local community. Haanstra is also a DuPont Pioneer dealer selling corn, soybean, wheat, and alfalfa seeds and inoculants. Despite his busy schedule with work and family, Haanstra was willing to let Grain Farmers of Ontario bring Soules and the media onto his farm because he believes in what the Good in Every Grain campaign is trying to achieve. One of the key messages promoted during the media tour was that science and technology are a part of agriculture — and that’s a good thing. Advancements in crop genetics have allowed for improved use of pesticides and herbicides and help farmers grow safe, reliable, and sustainable crops. It’s a message Haanstra agrees is important to promote with the public. “I think a common misconception is that farmers are somewhat reckless in our decisions and that we have no care for the environment. But every farmer cares for the environment and wants to be a steward of the land because we are family farms and we want to leave something for our families,” he says. Both Haanstra and Soules encourage other farmers to share their own farm experience whenever or wherever the opportunity presents itself. Soules’ Toronto television appearances reached more than three million viewers, his radio interviews were heard by over two million listeners, print outlets covering the story reached more than three million readers, and online coverage of his time in Ontario was viewed by nearly 12 million people. Burke believes the campaign was a success with consumers, but also believes it has generated a positive vibe about Ontario’s grain farmers. 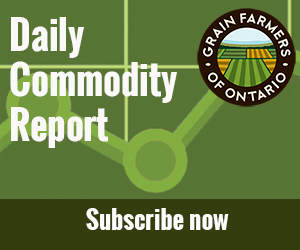 Go to www.goodineverygrain.ca to see the videos produced by Grain Farmers of Ontario and check out links to the media coverage you may have missed.